South Africa coach Peter de Villiers has named six uncapped players in his preliminary 49-man Rugby World Cup training squad. 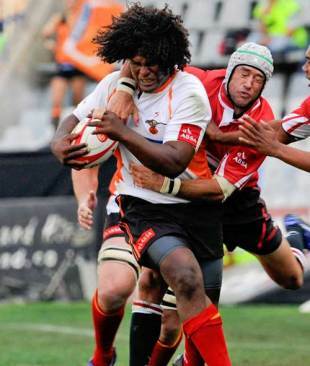 Cheetahs back-rower Ashley Johnson and Lions fly-half Elton Jantjes are rewarded for their form during the Super Rugby season as are Bulls prop Dean Greyling, his provincial colleague Werner Kruger, Cheetahs front-rower Coenie Oosthuizen and impressive Stormers flanker Duane Vermuelen who is included despite being sidelined with a knee injury. The squad also includes four overseas-based players in the form of Racing Metro centre Frans Steyn and the Ulster trio of BJ Botha, Ruan Pienaar and Johan Muller. There is plenty of experience with 21 of the squad having featured for the Springboks during their Rugby World Cup-winning campaign four years ago headed by captain John Smit, who will also lead the side into this year's tournament, and vice-captain Victor Matfield. "I'm very happy with the squad," said coach Peter de Villiers, who insists the selection door remains open to those not included in this group. "We have got a good blend of youth and experience as well as including some uncapped players who have forced their way into contention for selection with their performances in Super Rugby. "Our planning is at an advanced stage for the international season and the vast majority of these players have attended one or both of our planning camps. Our Castle Tri-Nations squad will be drawn from this group once we have been able to sort out those players who are carrying injuries at the end of the Vodacom Super Rugby competition." Bulls wing Bjorn Basson, a shock omission from the second of two recent training camps, earns a call up but there is no spot for the in-form Cheetahs scrum-half Sarel Pretorius and Stormers fly-half Peter Grant. There was also no space for Zimbabwe-born Northampton Saints tight-head Brian Mujati despite being one of the star performers of the recent Aviva Premiership season with Northampton. The Springbok squad for the Tri-Nations will be named on July 2 or 9 (depending on South African involvement in the Super Rugby Final), with their final World Cup selection set to be confirmed on August 23.